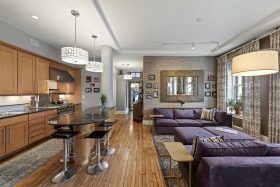 Steps away from Hudson Yards, this corner loft at 448 West 37th Street just hit the market for $1,750,000. 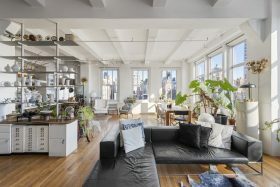 The Midtown West building is also known as the Glass Farmhouse—a former school building that was converted to condos in 1982—and this sun-drenched unit definitely lives up to that name. Ten 12-foot windows wrap around the 1,500 square-foot open layout, which promises plenty of opportunities for customization. The unit is currently configured as a studio with a sleeping alcove above the bathroom, but the listing shows alternate plans for those who may want to build out walls and transform it into a one or two bedroom. An apartment with direct views of the Merchant’s House, Manhattan’s last intact 19th-century family home, has just hit the market for $2,749,000. Spanning 1,800 square feet, the full-floor Noho unit boasts high ceilings, original hardwood floors, and chic designer-curated interiors. 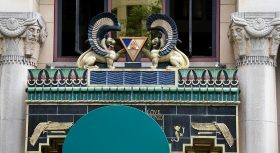 You’ll feel yourself steeped in the history of the location. 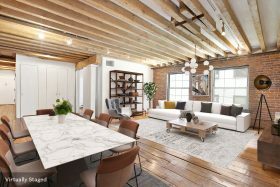 28 East 4th Street—part of the Noho Historic District—is a classic loft building dating back to 1901 when it was filled with tenants in the printing, apparel, and toy businesses. The building still features plenty of original cast iron, limestone, and brick detailing. 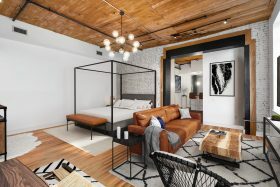 $7.995 million might seem steep for this grand 3,600-square-foot cast iron loft at 148 Greene Street, but the Soho co-op property comes with some great perks in addition to keyed elevator access, 13-foot ceilings, and 12 massive windows. First, the space contains two units, giving you the flexibility to use it for live/work purposes or reconfigure it for one sprawling full-floor home. More benefits: There are no tax or maintenance fees. Also, owners in the building benefit from proceeds of the commercial lease space on the ground floor. 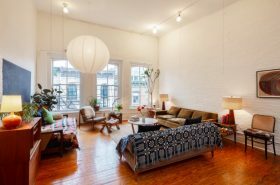 This classic corner loft co-op at 270 Water Street in a Seaport district that’s changing more every day has old-school Manhattan charm, up-to-the-minute renovated interiors and plenty of space and light. It’s a three-flight walkup, but the sunlight and City Hall views mean that can be as much a positive as a workout. It’s asking $1.485 million. 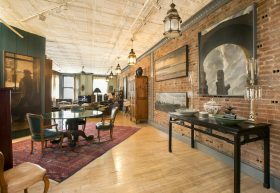 A rare find, this quintessential Soho artist’s loft in original condition has hit the market for the first time in 40 years, seeking $4,250,000. 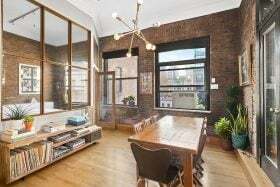 Located at 133 Wooster Street in the heart of Soho’s Cast-Iron Historic District, the sprawling 3,300-square-foot space has no shortage of pre-war details. 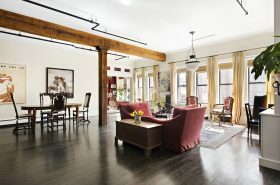 The sunny corner unit boasts 17 oversized windows with southern and eastern exposures, 10-foot tin ceilings, and original cast-iron columns. Currently the home and studio of a painter, the space is configured with two bedrooms and one-and-a-half baths, but the open, angular layout offers a lot of flexibility for future owners.